Since the firm was founded in 2002, Aabø-Evensen & Co has been a niche firm focusing on M&A transactions. In 2014, Capital markets transactions and IPO's also became one of the firm's main practice areas. 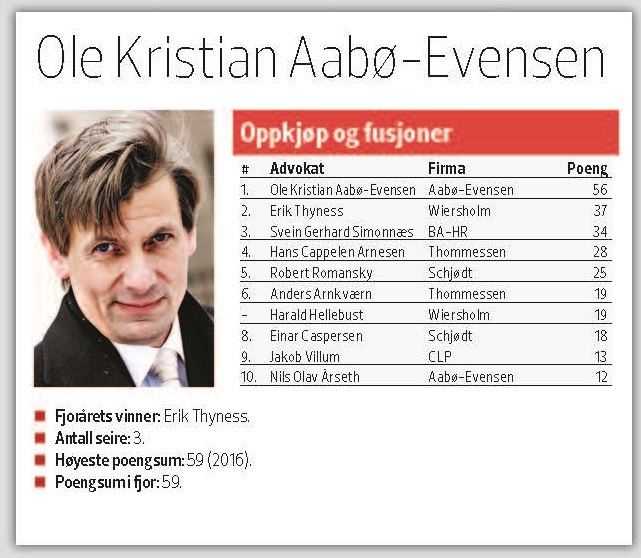 On individual basis, Ole Kristian Aabø-Evensen is ranked as Norway’s Top 1 M&A Lawyer for the fifth time. In addition, Lars André Gjerdrum is ranked as Top 1 “Up and coming” in the Capital markets and IPO’s category and as Top 4 in the “Up and coming” M&A Category. 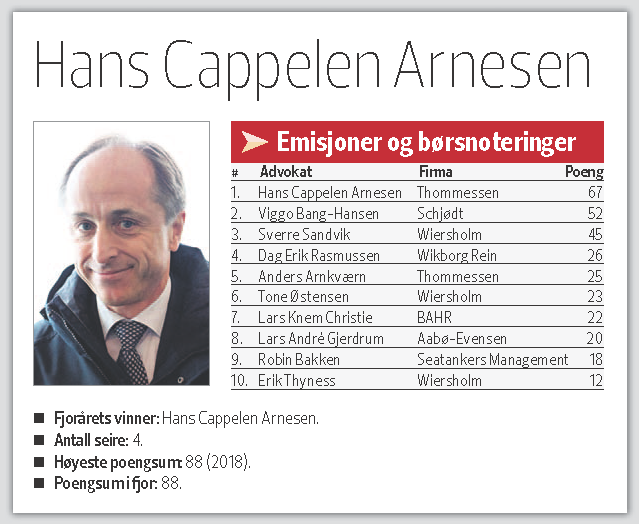 Furthermore, Lars André Gjerdrum is also ranked Top 8 under the main category of the Top Capital Markets and IPO Lawyers in Norway. The firm is honoured by this recognition. “First and foremost, this is an acknowledgement of the consistent efforts made by our team. 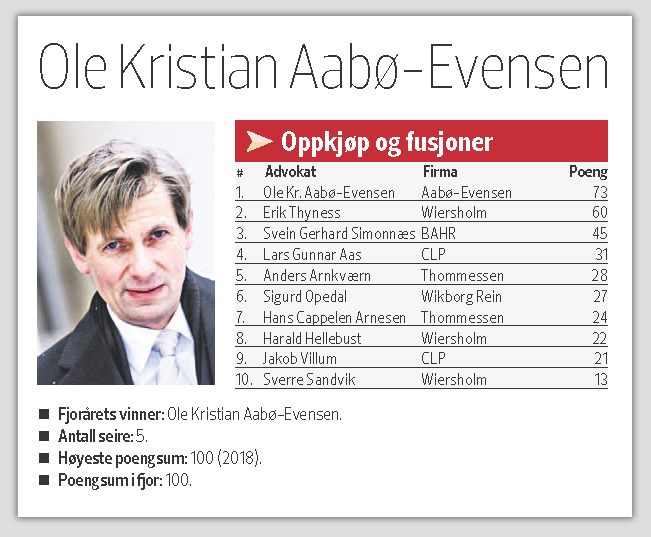 Many thanks to all our colleagues that voted for us” says Ole Kristian Aabø-Evensen. The annual peer review rank Norwegian lawyers in 26 categories and it is not allowed to vote inside the firm. 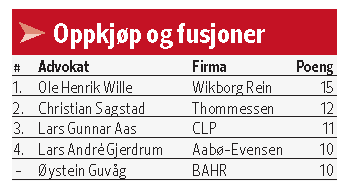 43 Norwegian law firms and in-house counsels have voted in this year’s review. To see the peer review in its entirety, please visit http://www.finansavisen.no/ to request a copy or or view the sections of the mentioned survey by clicking here. (Source: Finansavisen JUS Bilaget, published 14 February 2019) . In addition, three of the firm's lawyers are recognized in the categories for M&A and Capital markets transactions. Ole Kristian Aabø-Evensen and Nils Olav Årseth are both ranked under the M&A Category. Lars André Gjerdrum is recognised as “up and coming” under the Capital Market transactions category. 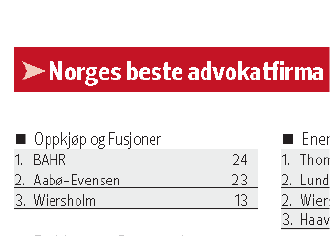 Aabø-Evensen & Co was ranked among Norway's top 3 M&A law firms in Norwegian newspaper Finansavisen in february 2015.